Middle school isn’t at all what Maddie hoped it would be. Not when her best friend has changed schools. Not without the calm, sure presence of her grandfather. If only friendships were as simple, as reliable as science. Though she finds herself surrounded by new potential friends, Maddie can’t help but think about all the reasons those students are wrong or annoying. To cope with her losses, she writes Standard Operating Procedures (SOP) in her journal. When Maddie’s new would-be friends read some of the SOPs that features how to escape them, they feel hurt and betrayed. Maddie realizes that pushing people away hurts her, too. In a dark moment, Maddie’s grandmother gives her some powerful advice about saying sorry. Maddie decides to do just that, even though it’s hard, and hope it’s enough to fix the mess she’s made with her friends and family. I found Maddie likeable immediately. She loves science and conducting experiments so much that her fashion-focused sister despairs of her. 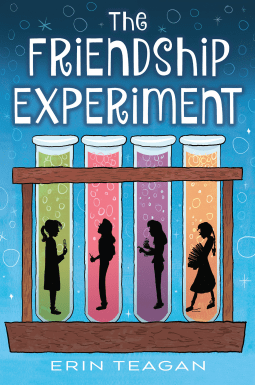 But Maddie finds friends who share her interests, and even convinces her dad to let her volunteer in a real lab. I loved that dedication. The von Willebrand disease also made for an unusual story element. I don’t know enough about the disease to really say how accurate the portrayal was, but it certainly felt as though it was a part of the story without distracting from it or being the central focus of either Brooke or Maddie’s characters. Though adults in Maddie’s life play a role in her drive toward resolution, Maddie herself has to take the action and make the choices that lead her to the end of the story. I loved how present her thoughts about her grandfather remain. It felt like a very realistic response to grief. If you liked The Fourteenth Goldfish or Counting by 7s give this spunky, science-loving story a try. Maddie and her sister both suffer from von Willebrand disease, which causes extended or excessive bleeding. I don’t remember race descriptions in particular, but I think all the characters are white middle class. Maddie’s mom brings home a painting that shows a nearly naked lady (she’s draped in a scarf.) Maddie and her sister feel pretty grossed out, and they ask more than once for their mom to remove the painting from its place above the fireplace. Later, the family learns the identity of the subject of the painting and decide to quietly move it somewhere more private. This isn’t violence, but because of the von Willebrand, both Maddie and Brooke suffer from serious nosebleeds. At one point a boy hits his head in soccer practice and his nose also starts bleeding. Tagged Erin Teagan, HMH Books for Young Readers, science, The Friendship Experiment, von Willebrand. Bookmark the permalink. Loved the sound of this. Totally MG. Yay!